ASA university Bangladesh (ASAUB) and Dept. of Information and Communication Technology,Peoples Republic of Bangladesh jointly conducted a seminar titeled "Awareness of Cyber Securityand Information & Communication Technology Related Legal Aspects" on 28 February 2015 at ASAUB campus. This is for information of all concerned that a seminar on " Awareness of Cyber Security and Information & Communication Technology Related Legal Aspects " jointly organized by ASA University Bangladesh (ASAUB) and Information & Communication Technology Division, Ministry of Posts, Telecommunication & IT, Peoples Republic of Bangladesh will be held on 28 February (Saturday) at 3:00 PM in the ASA Conference Room (9th Floor) of ASA Tower. Honorable Vice Chancellor Prof. Dr. Dalem Ch. Barman has given his kind consent to grace the program as the Chief Guest. Respected Advisor of ASAUB, Professor Md. Muinuddin Khan, has given his consent to be present as Special Guest. Respected Deans of all faculties and Chairmen of all departments will also be present in the program. Professor Dr. Abu Daud Hasan, Dean, Faculty of Arts and Social Sciences will preside over the seminar. Date : 28 February (Saturday) at 3:00 PM in the ASA Conference Room (9th Floor) of ASA Tower. 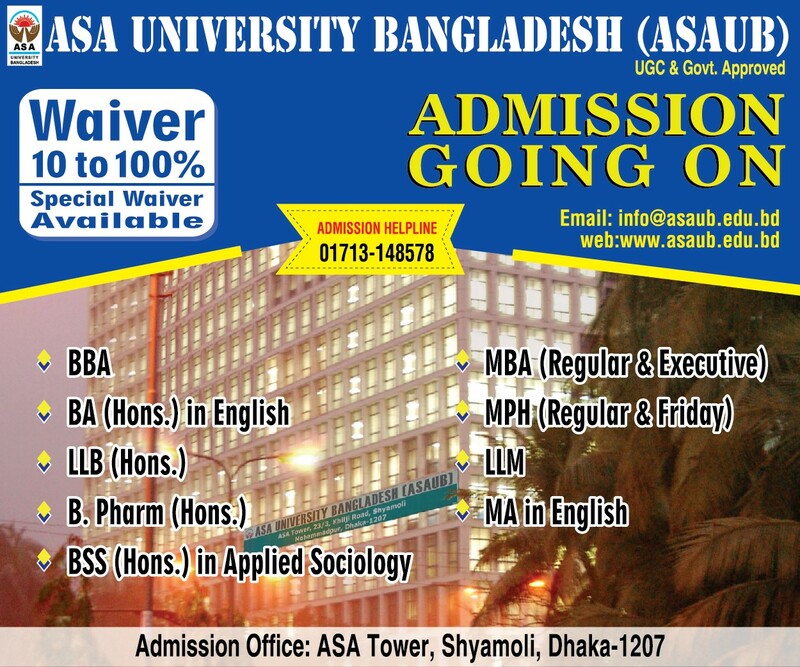 ASA university Bangladesh (ASAUB) and Dept. 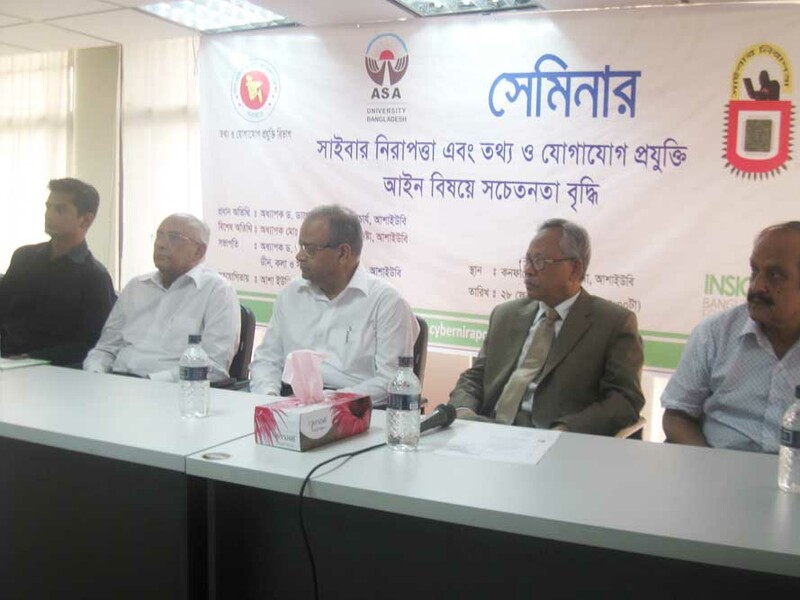 of Information and Communication Technology, Peoples Republic of Bangladesh jointly conducted a seminar titeled 'Awareness of Cyber Security and Information & Communication Technology Related Legal Aspects' on 28 February 2015 at ASAUB campus. The seminar began with the welcome speech given by Mr. Md. Khalequzzaman, Registrar, ASAUB. Prof. Dr. Dalem Ch. Barman, Vice Chancellor of ASAUB was present as the Chief Guest while Prof. Md. Muinuddin Khan, Adviser of ASAUB was present as the Special Guest. The seminar was presided over by Prof. Dr. Abu Daud Hasan, the Dean, Faculty of Arts & Social Science. Cyber Security & ICT Law expert Mr. Tanvir Hassan Zoha, Vice Chairman, Insight Bangladesh Foundation (IBF) and Mr. Atiqul Islam Khan, Director of Public Relation, IBF delivered their valuable speeches on this issue as the keynote speakers. The speakers discussed about the nature and scenario of cyber crime in Bnagladesh. 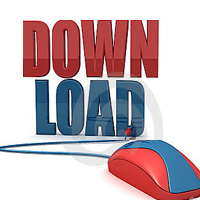 They focused on the safety measures that an individual can take while working online. They enlightened the audience on various issues such as defamation, financial and credit/debit card frauds and Cyber terrorism etc. Deans and Chairmen from different Faculties and Departments, Additional Registrar Mr. Md. Ashraful Haq Chowdhury, teachers and students from different departments and officials of ASAUB were also present in the program.